Oil analysis is a key element to equipment and component reliability at any nuclear power generation facility. In particular, having onsite oil analysis can significantly reduce the total turnaround time between sampling and condition-based maintenance recommendations that are required to keep equipment operating safely and efficiently. Cook Nuclear developed a successful onsite oil analysis program that helped improve equipment reliability and availability while reducing maintenance costs. The power plant found that by using its existing onsite chemistry staff and laboratory to perform onsite oil analysis it was able to save both time and money. The primary purpose of Cook Nuclear’s onsite oil analysis program is to be able to determine lubricant quality and machine conditions for emergent situations, helping to ensure that all nuclear safety-related and supporting equipment is maintained and available for operation. In addition, offsite oil analysis can be costly and slow. Regulatory requirements involved in releasing potentially radioactive material for shipment to offsite laboratories are in place at all nuclear facilities, and the offsite laboratories must be licensed to handle the material. This requirement can lengthen turnaround times and increase the cost of offsite testing. Most offsite labor-atories licensed to handle radioactive materials charge a surcharge for radioactive material handling/disposal or build the charge into the fees for each test performed. This is compounded in emergent situations when an expedited analysis is needed. It is common for the cost of a potentially radioactive oil sample tested on a rush basis to be three to five times the cost of a nonradioactive, routine sample. If the situation occurs outside the offsite lab’s normal operating hours, an opening fee is also added. While the costs for expedited oil analysis are insignificant compared to lost production costs, the fastest possible turnaround time may be insufficient to keep equipment operable and the plant online. Most power generation facilities have onsite chemistry labs to conduct water chemistry tests in support of power production. In nuclear power plants, the chemistry laboratory is rather sophisticated and can conduct many of the basic tests needed for oil analysis with minimal modification. Cook Nuclear’s onsite chemistry laboratory’s capabilities were evaluated, including the types of oil analysis tests that were conducted and its precision. The lab was typical, having the equipment needed for testing kinematic viscosity, neutralization number (AN, BN), moisture contamination, elemental spectroscopy, specific gravity and flash point. The lab took advantage of the equipment already available onsite and worked with management to obtain other equipment such as particle counting equipment, Fourier Transform Infrared Spectroscopy (FTIR) equipment, Direct Read (DR) Ferrography equipment for ferrous particle concentration testing and a microscope for analytical ferrography. Table 1 illustrates the test slate Cook’s oil analysis laboratory is capable of conducting. Laboratory procedures were revised or created based upon published ASTM standards or documentation from laboratory equipment vendors as applicable for each test. All laboratory equipment is routinely calibrated at a specified interval or pre- and post-analysis for quality control (QC) purposes. All QC activities are documented and archived. Routine oil samples are tested in batches at least once per week. Equipment requiring closer monitoring due to adverse trends or conditions in oil analysis or other predictive monitoring data is tested on an as-needed basis. Oil analysis data is submitted to the predictive maintenance oil analysis coordinator for review, interpretation and consideration/comparison with data from other sources. Recom-mendations are submitted to the appropriate station personnel within a time frame consistent with the urgency and need for action. Ongoing assessment of Cook Nuclear’s oil analysis program and participation with the lubrication community is driving many improvements in its overall proactive lubrication management program. Many pro- active measures at the power plant have been implemented and several others are progressing as plant personnel strive to achieve lubrication excellence. The plant lube oil storage room has been improved to include proper drum dispensing equipment, rack storage and better labeling. Cook Nuclear transitioned to disposable, single-use top-up containers, reducing the opportunity for contamination and therefore preventing the wasting of lubricants. Efforts are underway to reduce lubricant inventories by applying just-in-time procurement methods. First in, first out (FIFO) inventory management practices are preventing degradation of lubricants while in storage, and therefore waste. Best practices are also being pursued through equipment modifications. Enhancements include oil sample ports for more reliable and powerful oil analysis results, breather upgrades and oil filter element upgrades with local by-pass indication for improved contamination control, and fill and drain port enhancements to allow less intrusive and more effective lube oil changes and flushing. Combining the onsite oil analysis laboratory and offsite services is allowing oil and filter changes on-condition, replacing interval scheduled (traditional PM) tasks. Components not suitable for condition-based lube changes will have lubrication schedules evaluated and adjusted. Other testing methods and techniques will be implemented in the onsite oil analysis program to improve confidence in scheduling condition-based oil changes. The onsite oil analysis laboratory is also adding testing methods to support conformance testing of incoming lubricants for use in equipment required for nuclear safety. This process is similar to the testing of other incoming lubricants; however, significant documentation is required. Cook Nuclear’s onsite laboratory has the ability to test lubricants for conformance upon arrival, inexpensively and much more rapidly than offsite facilities for emergent situations. Additionally, the testing methods added to support this process will be available to provide onsite verification of used oil analysis test results that are currently sent to an offsite laboratory. While setting up Cook Nuclear’s oil analysis program, plant personnel identified some key components for creating a successful oil analysis program. When developing an onsite, or even an offsite oil-analysis program, it is vitally important that the organization appoint an individual to champion the program. Key maintenance, production and engineering personnel must respect this individual and understand the program’s mission. The program champion is responsible for assessing the oil analysis program’s status and providing documented short-term and long-term goals to management. 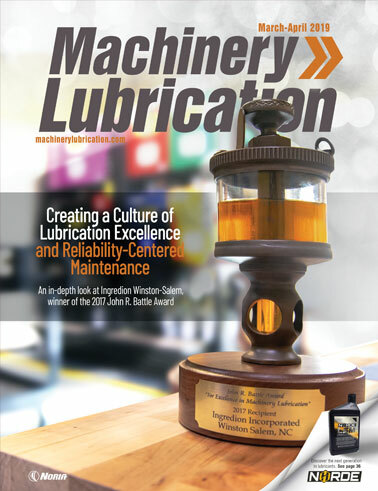 The assessment must take into account industry best practices, recommendations from subject matter experts, regulatory requirements and inputs from station personnel involved in any aspect of lubrication and overall reliability. It is important during this stage to gain buy-in from individuals affected by the program before attempting to implement recommendations. This buy-in makes the implementation process more successful and fosters teamwork via a cooperative, rather than adversarial, environment. Any successful onsite analysis program must be supplemented by an offsite laboratory. A reputable offsite laboratory should be employed to conduct supplemental tests that cannot be economically or effectively performed onsite or when confirmation of a result is needed. It is important to choose a laboratory that is familiar with the processes and demands of the applicable industry, is responsive to customer needs, uses appropriate methodologies and provides timely results. Cost should not be the primary consideration in offsite laboratory selection. It is preferable for the oil analysis program to reside within a comprehensive predictive maintenance department, including other core technologies such as vibration, infrared and thermographic analysis. In this case, the department can collectively develop recommendations based upon all available data, and communicate those recommendations to the rest of the organization. This usually requires a single database to store the predictive maintenance data so that it can be analyzed concurrently. Cross-discipline training in condition monitoring for predictive maintenance personnel is helpful. This improves machine health assessment and helps account for the relative strengths and weaknesses of each technology. At the program’s outset, the equipment and components that will be included in the oil analysis program should be determined. When selecting the equipment to be monitored, consider the sample point accessibility, regulatory requirements, production consequences, cost of equipment repairs or replacement, personnel safety, environmental risks and resources available for the monitoring program. Input from all personnel with a vested interest, including production and maintenance personnel, and management should also be considered. The next step involves identifying sampling points, methods and frequencies. Preferred sample points are those that are readily identified and accessible in the field. The first priority, however, is to obtain the most representative sample achievable. Among equally appropriate sample options, consider using the least intrusive and most convenient. There are many references available in selecting the best sampling location. The OEM may be able to offer guidance or a reputable subject matter expert can help. If an inferior location and method are all that is available, implement the necessary modifications before wasting time and money obtaining samples of little value. Unreliable data resulting from bad samples and other sources of error are a lab’s worst enemy when diagnosing machine health. Oil samples should be collected while equipment is operating or within 15 minutes of shutdown to obtain a quality sample that will provide the most accurate lubricant and machine condition assessment. Sampling frequency should be consistent with the criteria used to determine the scope of the program. In addition, consider each component’s environment and service, the lubricant used, run time since maintenance was last performed, OEM recommendations and other condition-monitoring data. It is advisable to sample more frequently when starting the program, because no baseline data yet exists. As dictated by experience, sample frequencies and target, and alarm and limit criteria for the parameters being monitored can be adjusted as needed. Sampling methods for all components in the program should be detailed in written procedures that are readily accessible to those responsible for collecting samples, and training on their proper execution should be provided. The procedure should give specific instruction on what is to be included on the sample bottle label and any additional information that should accompany the sample. The goal is to obtain clearly identified, reproducible and bias-free oil samples that minimize analysis errors, thereby allowing confidence in decision-making. The procedure should also dictate where the oil sample should be delivered. Tracking numbers or bar-coding is useful for chain-of-custody purposes and helps ensure that samples are collected and analyzed in a timely manner. The operations and maintenance staff are important allies, and establishing a good working relationship with them is vital to the success of the oil analysis program. These individuals can provide useful feedback during operation and maintenance activities between samples. It is important that the oil analysis coordinator frequently tour the plant. While lubrication issues may be detected during these inspections, becoming familiar with the equipment, the lubricants used and those responsible for the equipment’s operation is important when station personnel report unusual conditions or have lubrication concerns. In a large power generation facility, it is nearly impossible for the oil analysis coordinator to be present during each maintenance activity or as problems develop. Some events occur so quickly that they cannot be detected effectively by routine oil analysis. There have been instances at Cook where others identified a degraded lubricant condition via visual observations and made timely notifications to the predictive maintenance staff. This includes components from both inside and outside the routine oil analysis program. 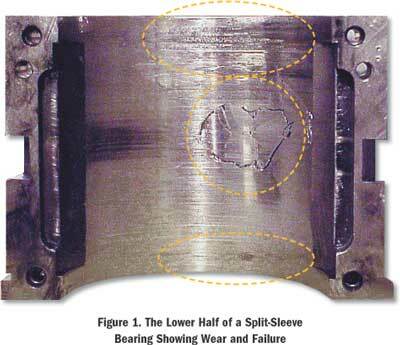 Figure 1 shows the lower half of a split-sleeve bearing that was removed from a 600 hp electric motor. This particular component was not part of the routine oil analysis program, and vibration monitoring data and infrared thermography imaging failed to indicate a problem with the machine. Operations staff noticed a change in oil color and contacted the predictive maintenance department. Analysis of oil samples taken from the bearing housing indicated a significant amount of wear debris. This attention to detail and prompt reporting by the operations staff was the key in saving this equipment from further damage. Cook Nuclear’s staff responsible for sampling is also trained on expectations of individual machines. Sensory lubricant tests can, and often do, detect degraded lubricant conditions prior to laboratory testing. A significant amount of time can elapse before laboratory analysis and machine damage can take place during this time. A critical step, therefore, in performing sensory tests is to contact the oil analysis coordinator immediately when there is a concern so that appropriate action can be taken. Clear sample bottles are preferred for performing sensory tests. These tests and evaluation techniques are included in Table 2. 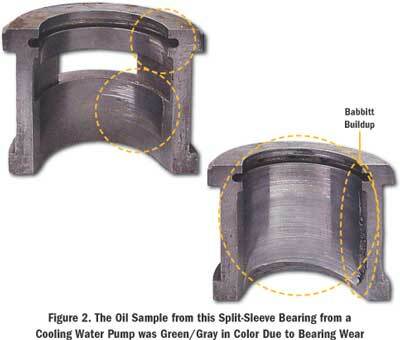 Figure 2 is an image of a split-sleeve bearing from a cooling water pump. While obtaining a routine oil sample, the technician noticed that the oil appeared green/gray and immediately reported this condition to the oil analysis coordinator. Oil analysis tests were expedited, revealing high levels of lead and tin in the elemental spectroscopy indicative of bearing wear. Further investigation revealed abnormal loading of the bearing resulting from the pump not being adequately filled and vented when placed into service. The technician’s attention to detail in the field and prompt reporting of the condition prevented further damage to the component. An onsite oil analysis laboratory can provide significant bottom-line value to a business, increase equipment reliability and availability, and reduce maintenance costs. The effective deployment of an onsite oil analysis program requires detailed planning and implementation. Cooperation and communication are essential. It is important to fully assess current capabilities to take full advantage of them. Training and qualification of the staff in lubrication fundamentals and oil analysis is paramount, allowing all personnel to identify adverse lubrication conditions and to promote the implementation of best practices. The results of tests and field observations need to be acted upon promptly, and should be used in conjunction with other predictive maintenance and process information for improved effectiveness. Troyer, D. and Fitch, J. (1999). "Oil Analysis Basics". Tulsa, Okla: Noria Corp.
Toms, L. A. (1995). 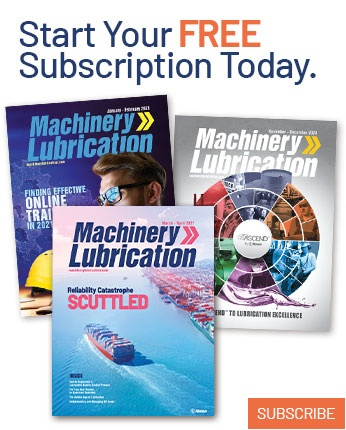 "Machinery Oil Analysis Methods, Automation, and Benefits". (2nd ed.) Virginia Beach, Va: Coastal Skills. Bannister, K. E. (1996). "Lubrication for Industry". New York: Industrial Press Inc.
Fitch, J. (2000). "The Lubrication Field Test and Inspection Guide". Tulsa, Okla: Noria Corp.
Nuclear Regulatory Commission. (2002). 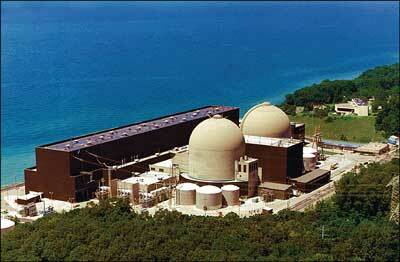 "Quality Assurance Criteria for Nuclear Power Plants". (10CFR, Appendix B to Part 50). Washington, DC: Government Printing Office.